Each year, four faculty members are honored for their commitments to teaching, service, scholarship/creative expression, and adjunct teaching, per nomination by students, faculty, and administration. 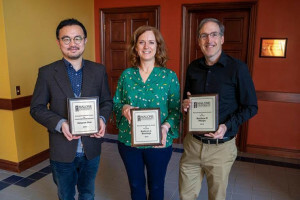 2019 Honorees are Matthew Phelps, Kate Huisinga, Sangsun Choi, and Michele Waalkes. Matt Phelps is an exemplar of servant leadership. He served admirably for years as director of faculty development and is now director of general education. Dr. Phelps clearly cares about his students and wants everyone to do well. He is a tough but great professor, and has changed many of our lives for the better. He got me through my hardest semester. Dr. Huisinga made the classroom a place of both learning and fun, and it was clear that she loved both her job and her students. She went above and beyond what was expected. Dr. Huisinga is involved in so much on campus, but she still makes time to answer questions. She's always available if you need help, and she asks about my personal life as well and makes me feel cared for. She's a great example of a disciple of Christ. She's all-around amazing! Sangsun is a fantastic filmmaker who has screened his work through many prestigious international film festivals and academic conferences. I believe that he has impacted on diverse students through his creative researches since he came to Malone as an international faculty member. He received the best faculty short documentary award from the Broadcast Education Association in 2018, a considerable achievement. BEA is the most influential media organization in the world, and the competition is also the most significant event in the creative academia. Of more than 1,500 submissions, Choi's received the best award. His work was screened through many Academy Award qualifying festivals that generally have an acceptance rate of less than 5%. His work was selected as top 10 documentaries in such a prestigious event. He makes a film annually and his recent two documentaries were accepted from such prestigious festivals. Also, he has screened his work through many local festivals in Ohio. He is a wonderful role model for the Malone creative students and local young artists. He always tries to utilize his creative work as his class resources, so many students are inspired by his ongoing projects. I am in the Art Analysis class with Michele Waalkes and am so impressed by Michele's love of art and her desire to ignite us with that same passion. Michele's devotion to art created interest in us as a class. From group activities, videos, museum visits, to the actual resource (that covers an exhaustive topic as a synopsis but in an appealing way), the variety of teaching methods as she had us over six hours per session - her love for art was contagious. Michele welcomed our input and embraced our uniqueness in our reasoning as we reviewed art without judgment. This makes me feel respected and valued which allowed me to explore further as I internalize the art. Michele is a true artist, and her knowledge and enthusiasm was visceral. The periods of art were apparent and made sense to me without cramming for a test. I have been to Rome, and now I hope to go back because I feel that I have more understanding, excitement, and affection for art because of her teaching. She is art walking into the classroom, changing lives from the inside out. I appreciate her integrating faith in her teaching especially since art is divine in how it reaches our souls.